Library Faculty Assembly Home Archives Documents Officers Assembly Committees Career Development Libraries Budget Nominating Strategic Planning Special & Joint Committees Faculty Committees Faculty Senators Sabbatical SPEP Tenure & Promotion Other Governance Committees UF Faculty Senate University Libraries Committee Future of the Libraries Committee myUFL login required Library Catalog Databases Site Map SearchFaculty Governance at the University of Florida LibrariesMinutes June 19, 2006: 2:00-4:00pmRoom 361, J.W. Reitz Union Meeting called to order Agenda approved without amendment Minutes from previous meeting approved without amendmentChair's Report:Carol K., Chelsea, and the By-Laws Committee met with Dale and Faith to discuss their reaction to the draft by laws. It was very positive overall. Dale is particularly interested in getting the nominating and strategic planning committees up and running. The Library Council/Directors planning retreat is taking place on July 17th and Dale was interested in Assembly representation at that event. Since the committees will not have been formed at that point, it was suggested that the Faculty Senators, Carol K., and Chelsea could attend as Assembly reps, including members of the by-laws committee to ensure HSCL and LL representation as well.Senate Update:No meetings occurred, so no report. Instead Cathy M. introduced Danaya Wright, the current chair of the Faculty Senate. Dr. Wright is a member of the Law School faculty. Dr. Wright had three areas of comment regarding the libraries: Library Strategic Planning committee-This committee is also being called the reorganization committee leading to a view that it is possible that the UF administration is considering folding the Health Sciences Library back into the Smathers system. The committee is being chaired by Will Harrison. New information was presented in that the committee has been made a joint Presidential/Senate committee. The charge is still in the process of being written. Anybody with comments or suggestions for the charge should feel free to contact Dr. Wright danaya@ufl.edu Since the committee hasn't been entirely formed yet, it seems unlikely that a report will be issued in September. Dr. Wright opined that the report might be timed to coincide with the announcement of the new director which leads to her second area of comment. Search committee for the new Library Director-Dr. Wright said that the Search committee for the new director will be lead by Joe Glover [It has been confirmed that Carol Drum has also been asked to serve on this committee]. So far, only one committee has been formed and there is a representative from the College of Medicine has been appointed. [We will post the search committee names as soon as we find out who they are.] 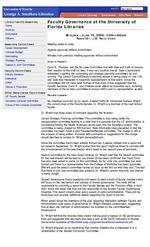 The fact that there is only one committee also added to Dr. Wright's opinion that only one director is being sought. Shared Governance-Every academic unit needs to elect a body of faculty members who will focus on the mechanism and policies of shared governance. This body will be responsible for providing a report to the Faculty Senate and the Provost's office in April 2007 which will detail how that unit has responded to the Shared Faculty Governance Directive. This report should cover every aspect of policy administration. There will be workshops and possibly additional details regarding the report in the fall. When asked about the intentions of the plan regarding interaction between Faculty and Administration over areas of governance Dr. Wright stressed collaboration, suggesting that at least one member of administration be included on the committee/task force/council. Dr. Wright felt that the libraries were clearly making good progress on the governance front and suggested that we might also take a look at the AAUO Indicators of Shared Governance available at http://www.aaup.org/governance/resources/tsurvey.pdf Dr. Wright wrapped up by mentioning that another initiative she is interested in is a revitalization of the Senate Curriculum Committee.